The letters comprising this small charming novel begin in 1946, when single, 30-something author Juliet Ashton (nom de plume Izzy Bickerstaff) writes to her publisher to say she is tired of covering the sunny side of war and its aftermath. When Guernsey farmer Dawsey Adams finds Juliet’s name in a used book and invites articulate—and not-so-articulate—neighbors to write Juliet with their stories, the book’s epistolary circle widens, putting Juliet back in the path of war stories. The occasionally contrived letters jump from incident to incident—including the formation of the Guernsey Literary and Potato Peel Pie Society while Guernsey was under German occupation—and person to person in a manner that feels disjointed. But Juliet’s quips are so clever, the Guernsey inhabitants so enchanting and the small acts of heroism so vivid and moving that one forgives the authors (Shaffer died earlier this year) for not being able to settle on a single person or plot. Juliet finds in the letters not just inspiration for her next work, but also for her life—as will readers. I’ve always had to wonder when I read a novel comprised entirely of letters. I think, well, it’s either going to be very, very good or will peter out after the second chapter and become tedious, repetitive, and boring. I’m happy to say that “The Guernsey Literary and Potato Peel Pie Society” by Mary Ann Shaffer falls definitely into the former and not the latter category. It is very, very good, and (if I had to assess why) it’s because Shaffer tells a story and stays in command of the story to the very end. And the story itself is a dramatic one and based upon a recent historic event – the occupation of the Channel Islands by the German army during World War II. The Channel Islands lie just off the coast of France but have allegiance to Great Britain. Technically, they are not part of Great Britain, but their inhabitants sound (to an American ear) as British as any Briton. They were owned by Duke William of Normandy, who retained ownership after he invaded and won Britain in 1066. Because of the proximity to France, the British Army and Navy couldn’t defend the islands, so they became as much German-occupied territory as France and the rest of Europe. Their people were treated much the same as the rest of Europe. Which means very badly indeed. But it’s now 1946, and writer Juliet Ashton, fresh from a rather surprising success as the author of a collection of her funny wartime columns for the Spectator, is casting about for a new project. She’s previously written a biography of Anne Bronte, which wasn’t exactly a bestseller. So, the success of her collection of columns is welcome news indeed. Juliet receives a letter from a Guernsey resident named Dawsey Adams, a pig farmer interested in, of all things, the 19th century writer Charles Lamb. He has come to own a book of Lamb’s writings originally owned by Juliet (her name and former London address – bombed by a V2 rocket late in the war – is written in the inside cover. 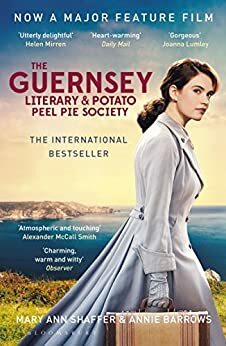 She begins a correspondence with Mr. Adams, and soon finds herself writing to other members of The Guernsey Literary and Potato Peel Pie Society, a reading group formed rather hurriedly (as in, on the spot) when the Germans found a group of Guernsey residents out after curfew. In London, Juliet finds herself being amorously and rather relentlessly pursued by a wealthy American, but she isn’t sure if she’s interested or not. So a trip to Guernsey is just the ticket to work on a book and escape the would-be lover. And it is on Guernsey that Juliet discovers but never meets the founder of the society, Catherine McKenna, whose story becomes a story of the war, how people survived the occupation, and how they didn’t. Shaffer, who worked as an editor and librarian and also in bookshops, died in 2008. The novel was completed by her niece, Annie Barrows, the author of the “Ivy & Bean” and other children’s stories and the novel “The Truth According to Us” (2015). And while I want to tell you that you always want to see an author enjoy a well-deserved success, there is something about all of this that fits the author’s story and the story she tells. “The Guernsey Literary and Potato Peel Pie Society” will make you laugh and make you cry. You will be struck silent at times. You will see how people cope in horrible circumstances, and what they to do help (and hurt) each other. And you will learn the difference books can make (including being used for kindling, but that’s another story for another letter). Oh, before I forget, the book’s been made into a movie of the same title, coming soon (I hope) to a theater near you! It stars Lily James (of Downton Abbey and Darkest Hour fame) as Juliet, and there are several other Downton Abbey stars in it. Pigs end up playing a major role in this wonderful little book when the author connects with some villagers on Guernsey Island, who have recently emerged from German occupation during World War II. She learns how they outsmarted the Germans, who were fussy over farm animals, according to one explanation of how The Guernsey Literary Society came about in the first place. Spoiler alert: it was because of pigs.